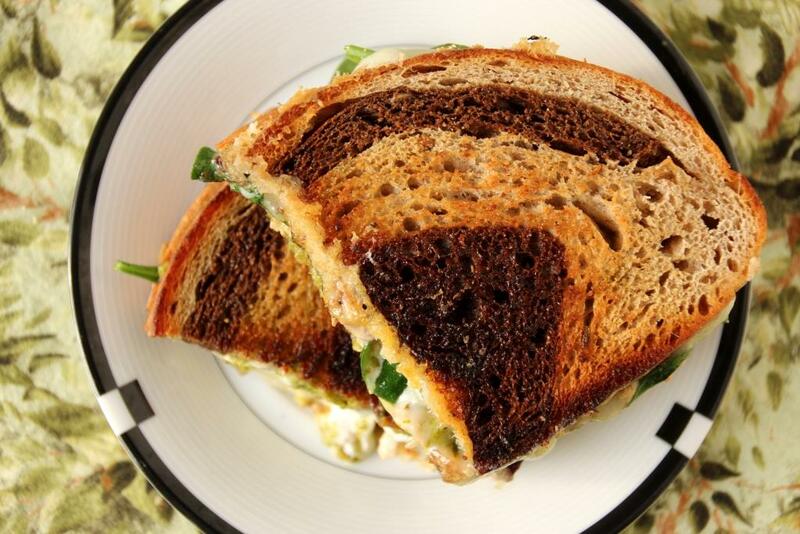 Omnivores can cheer, this sandwich contains meat! 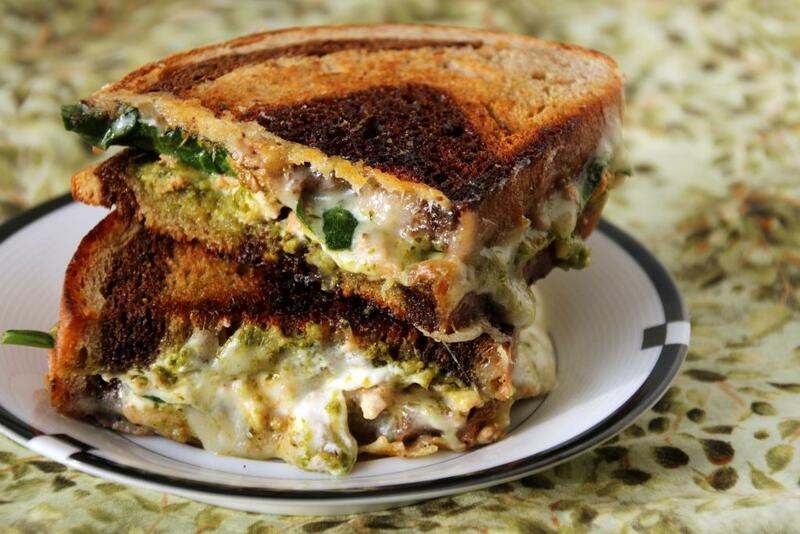 Mildly inspired by my favorite panini at a local Italian restaurant, this recipe is hearty and filling but still a more exciting profile than your traditional cheddar. I feel like most places with a “gourmet” grilled cheese option just shove about eleven pounds of cheese on there, with maybe the option of bacon and tomato. Although there’s nothing wrong with this method and it can be quite delicious (other than ruining a perfectly good sandwich with mostly raw tomato), I don’t find it particularly new and interesting anymore. 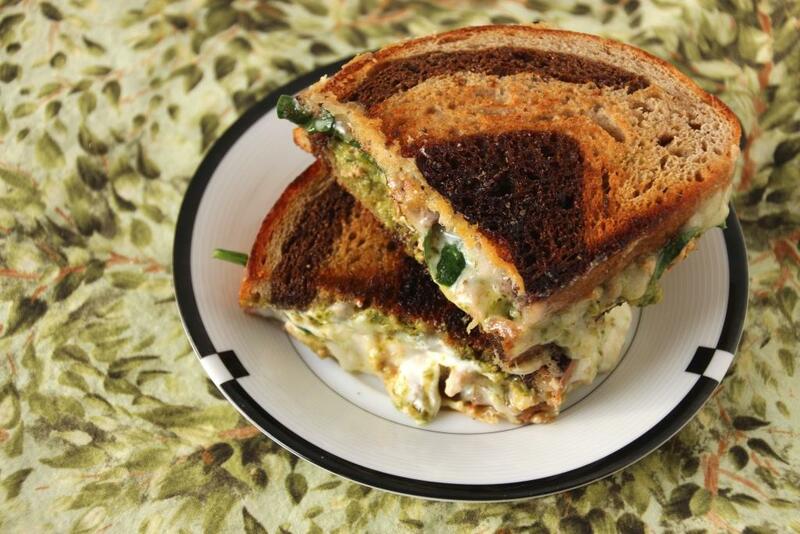 However, pesto and chicken are a match made in heaven and adding cheese to the concoction can only improve it. I chose Gruyère, mainly because I love Gruyere, but any sort of cheddar or pepper jack or whatever have you around would be equally delightful. A smidge of goat cheese adds a wonderful creaminess and a slight tang, but is totally optional if it’s not your thing. For an extra veggie boost I added a layer of fresh baby spinach which complemented everything nicely. This is a great way to use up leftover chicken (which is what I did) but is definitely worth it to make specifically as well. I picked a striped rye bread I had around which was excellent, but almost anything would be awesome. Also, tangy cheese and herby pesto are a fantastic combination in themselves, so for a vegetarian option just leave out the chicken (or replace it with roasted bell peppers). I promise it’s excellent both ways. In a medium pan (big enough to fit both slices side by side) heat a little butter or oil over medium-low. 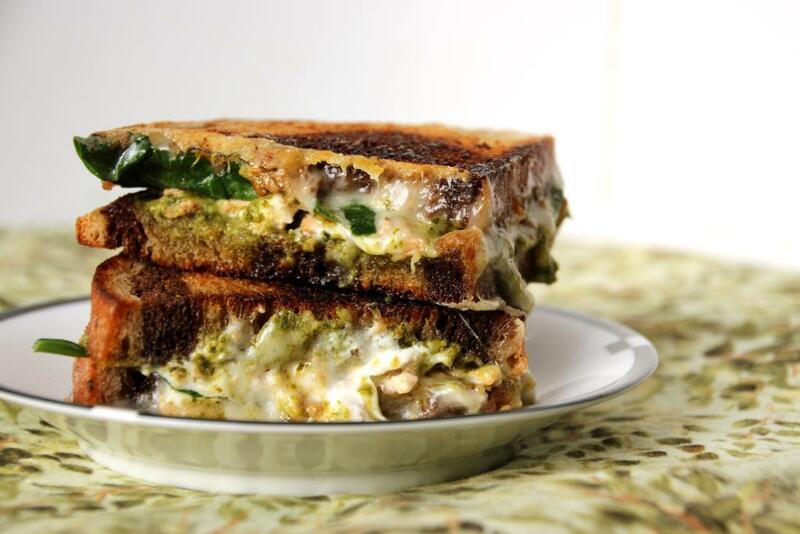 Spread pesto on one slice of bread. Dollop with goat cheese (if using) and top evenly with chicken. Optionally, add a layer of fresh spinach atop the chicken. Arrange Gruyère on the other slice and transfer both to the pan. Place a lid (or a plate, or whatever you have around) over the pan and continue to cook low and slow until the cheeses are melty and warmed through. Gently move the Gruyère slice on top of the other and cook an additional 30-60 seconds so the flavors meld.